If you do thing often enough, it becomes habit. If you perform a service for enough people for enough time, you become infrastructure. 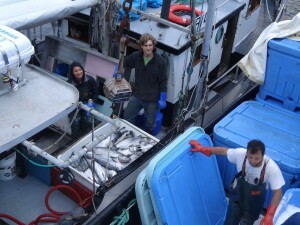 Skipper Dave Castle and his vessel, F/V Eyak, qualify as Baranof Island infrastructure. 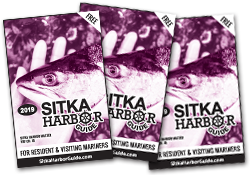 They are a vital link between Sitka and the few hardy people who live in Port Alexander, at the hatchery at Port Armstrong and at the government research station at Little Port Walter. Once a week in winter and twice a week in summer, Castle delivers to these outposts food and all manner of supplies. What makes him infrastructure is that he also carries the U.S. mail. Most mail carriers must deal with “snow, rain, sleet and gloom of night,” but few brave 25-foot waves and 50-knot winds to complete their appointed rounds. Castle said he makes most of his income buying fish aboard the Eyak on the grounds during the season. When the Eyak is busy on the fishing grounds, Port Alexander and points south get their mail and goods via F/V Silver Arrow — a smaller, faster vessel that Castle also owns. 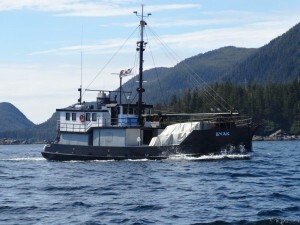 F/V Eyak is 71-foot-long (86 feet overall) with a 24.5-foot beam. It is classified as a power scow. It is all wood, capped with a steel toe. “Like a steel-toed boot,” Castle said. The vessel was built in 1943 for the New England Fish Company and named for the Eyak people and river of the Copper River region. Castle said the Eyak is somewhat unusual for that period because, while many similar vessels were built as warships, the Eyak was actually built to buy fish. In order to ply shallower river waters, Eyak was built with a flat bottom. That’s where Castle’s expertise comes into play. Castle admits he sometimes wishes Eyak had a smoother running V-bottom, but says this with obvious love for the vessel. Cruising speed for Eyak is 6 knots, at which speed the vessel burns 10 gallons of fuel or less per hour. Castle said at 7 knots and above the fuel consumption rises sharply, reaching around 30 gallons per hour at 9 knots. He said it’s about 75 nautical miles from Sitka to Port Alexander along the outside of Baranof Island. Taking the inside route through Chatham Strait to Port Alexander clocks in at about 145 nautical miles. 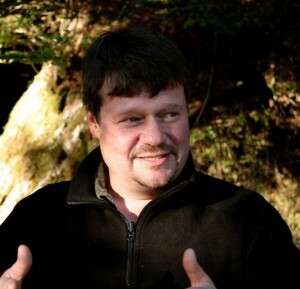 For obvious reasons, Castle said nearly all his trips are down the outside of Baranof Island. “Sometimes, if I have a big load of fish food in heavier weather, I might take the longer route,” he said. 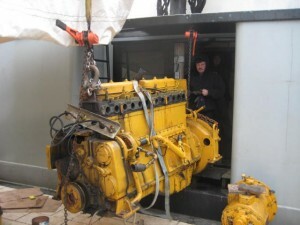 Eyak is powered by two 285 Cummins diesel engines. The old engines they replaced a few years ago were a pair of 1936 115hp Caterpillars. Eyak was built in 1943 — seven years after her engines. “I think that wartime shortages might have been the reason why the new boat had the older engines, Castle said. On the Friday afternoon I met with Castle, he and a deckhand were loading Eyak at the city bulkhead. A week before, he had hauled 250,000 lbs of fish food to Deep Inlet. This day he was taking 26,000 lbs. of fish food to Port Armstrong. 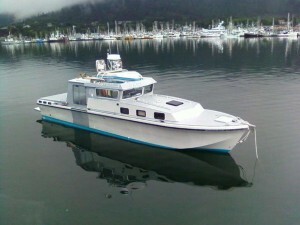 Castle said he operates under a unique-to-Alaska federal regulatory provision that allows commercial fishing tenders to serve remote communities that don’t have bi-weekly common carrier service. “I am allowed to haul freight as a non-inspected vessel because there are no licensed carriers operating in that area,” he said. Castle and Eyak have been carrying the U.S. mail since 1998 when the Ketchikan-based air service that had the mail contract went out of business. Castle said authorities asked him to haul the mail once. Then, they asked him if he could do it for a month or two more. Then, Port Alexander residents lobbied the post office to let Castle carry the mail for them permanently. Then Castle had to break off the interview. The regular shipment of building materials from Spenard Builders Suppply was expected shortly. The Eyak carries UPS packages on the last leg of their journey (Castle also carries Fed Ex packages, which travel as mail.) He carries freight for Alaska Marine Lines and Samson Tug & Barge. Groceries are carried as U.S. mail. “In winter, a regular load of general cargo and mail would be about 1,500 to 2,500 lbs. for Port Alexander, Port Armstrong and Little Port Walter,” he said. In spring, his average load might swell as new building projects are started. Castle hails originally from interior Alaska – Wood River, near Fairbanks. Castle’s father was a guide and Castle was homeschooled. When he was just 14, he met a group of people from Southeast, who invited him to come and work on a boat. 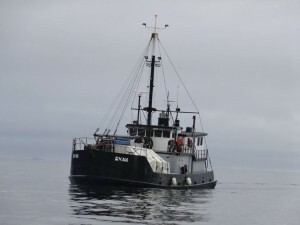 In 1989, he started running Eyak as a tender for Sitka Sound Seafoods, and in 1996 he bought the vessel. Castle purchased Silver Arrow in 2000 to move mail and freight when the Eyak is busy buying fish. Castle said he has taken many trips alone, but often travels with a mate, or with a passenger hitching a ride one way or the other. Castle’s children are grown up and moved away – his older son Ryan is a journeyman electrician in Fairbanks and his younger son John is working his way into the film business in Florida. Both sons grew up in Sitka. 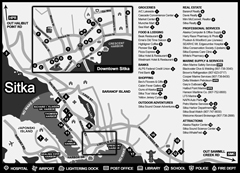 But Castle is firmly rooted on Baranof Island – or more accurately, anchored to it. Eyak is Castle’s home; he lives onboard full time with a Blue Heeler named Olive — a dingo and Australian shepherd mix. Eyak’s pilothouse and galley have an open-floor-plan feel, and both dog and man look supremely relaxed in the space. Castle said he has plans to make Eyak both a more comfortable home and a better hauler. He wants to put a big porch aft, to replace the smaller deck now there. This will give him space to add a big box cooler and a freezer and a hot tub and an artisan oven. Soon it will be time to shove off.